Carney enjoyed spending time with family (pictured with Patricia and grandchildren Cate and Andy Goering). But it’s more than his Irish heritage, engineering background and the St. Pat’s party atmosphere that makes Missouri S&T Chancellor John F. Carney III feel at home during the campus’s most celebrated tradition. It’s also the crowd that St. Pat’s draws to campus. With hundreds of alumni returning every March, Carney gets plenty of opportunities to connect with alumni. That, he says, is one of the most important — and enjoyable — parts of the job. Since 2005, Carney has met and welcomed hundreds of alumni back to campus during St. Pat’s, Homecoming, class reunions and other occasions. He’s also traveled around the country to meet alumni — at section meetings, road games and various special events. 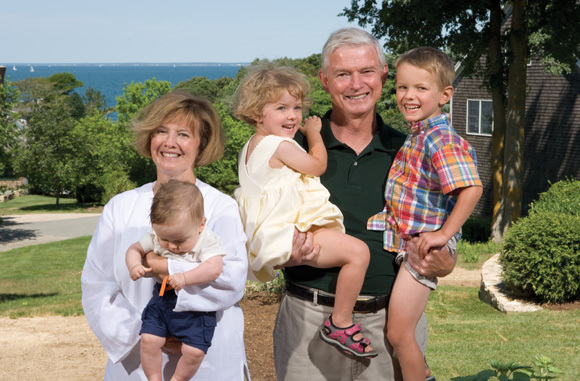 When the chancellor retires from his position in August, he’ll travel back to his native Massachusetts to spend more time with his two daughters and four grandchildren. No doubt he’ll catch a Red Sox game or two and perhaps attend a St. Patrick’s Day parade in Boston, which also has a reputation for throwing a pretty good St. Pat’s party. While celebrations like St. Pat’s remind us of S&T’s heritage, leaders like Carney remind us that progress and change, even for 140-year-old institutions, are crucial for survival. The university he leaves behind has changed, visibly and fundamentally, from the campus it was when he first arrived. Thanks to Carney, the university has a new look, a new academic structure and a new name. In many ways, the condition of Missouri S&T is the best ever. When Carney first arrived in Rolla — or “Rawler,” as it sounds in his Boston accent — the university was on an upward trajectory. Enrollment was growing steadily, new academic programs were attracting a more diverse student body, and research funding and donor support was up. Much of this was due to the work of Carney’s predecessor, the late Gary Thomas, who served as chancellor from 2000 to 2005. Under Carney, the university continued that momentum, achieving record fundraising and near-record enrollments. Early in his tenure, though, the chancellor saw some potential roadblocks that could hinder future growth. In his view, the way the campus was organized stifled collaboration. On top of that, the university wasn’t getting the recognition Carney thought it deserved. Future historians may define Carney’s legacy at S&T in terms of how he addressed those two issues. At least one contemporary historian sees one of those issues as the defining characteristic of the Carney years. “The one thing he did that might be most lasting is the name change, because the recognition of the university outside of Missouri is clearly higher now,” says Larry Gragg, chair and Curators’ Teaching Professor of history and political science. Gragg also chaired the selection committee that recommended Carney for the chancellor’s position. Despite this legacy, the students, alumni, faculty and others who worked most closely with Carney see him as more than a change agent. Known for his sense of humor, quick wit, and passion for sports (especially the Boston Red Sox) and his family, he’s also been described as an excellent communicator and problem-solver, a confident catalyst, a hospitable and “genuinely good person,” a caring but business-minded leader, and an inspiration to those dealing with personal adversity. He’s seen as someone who strengthened the university’s connection with alumni — even while pressing forward with decisions that weren’t always popular. Younger alumni who were students during Carney’s tenure also see him as a strong advocate for students. Another former Student Council president, Lauren Huchingson, IST’07, describes Carney’s approach as both businesslike and compassionate. Carney’s 45-year academic career began in 1966, when he joined the University of Connecticut’s civil engineering faculty. He later held faculty and administrative positions at Auburn, Vanderbilt and Worcester Polytechnic Institute before coming to S&T. Along the way, he built a reputation as an international expert in traffic safety research. Reputation, or the lack of it, was one reason Carney pushed to change the university’s name from the University of Missouri-Rolla to one that more accurately described its true nature. “Being a civil engineer, I’d long had an appreciation for the quality of the institution,” Carney says. But soon after arriving on campus, he discovered that his appreciation wasn’t widely shared. The name change, which took effect in 2008, has helped to remedy that situation. A year later, at the encouragement of the university’s Board of Trustees, Carney introduced the possibility of a name change. Through forums, conversations, electronic surveys and this magazine, Carney presented his case for the name change to various groups — students, faculty, staff, alumni, Rolla community leaders and others. Roller acknowledges that the name change and academic restructuring proposals “weren’t wildly popular” with some alumni. But Carney’s analytical approach to presenting his ideas won many over. Carney’s communication skills were put to the test during the name change process. If some alumni weren’t wildly supportive of the proposal, significant portions of the student body were even less so. Huchingson, who served as StuCo president during the name change, recalls with admiration how Carney prepared her, Morrey and other student leaders for handling student concerns before publicly unveiling his plans to begin the name change discussion. Beyond the campus, Carney also spent time talking to alumni about the changing economics of public higher education. In meetings with alumni sections, he emphasized how declining support from the state required the university to rely more on private support. Once Carney made the case, alumni were more open to support the university. “At about that same time, we started being very direct with the graduating classes about the extent of financial aid they received” and encouraged them to donate to the Miner Alumni Association. The approach has worked. Even during the recession and slow recovery, donations to Missouri S&T have held steady. The university surpassed its $200 million goal for the Advancing Excellence Campaign, which ended last summer. Major construction projects — including a the Kummer Student Design Center, the first building for Innovation Park and the Miner Dome athletic training facility — were all completed within the past year. The student design center and Miner Dome were funded entirely through private donations. In December 2009, Carney lost his wife of 45 years, Patricia Reynolds Carney, following a two-year battle with cancer. In the months after her death, Carney poured much of his energy into the job. The name change and academic reorganization now behind him, he focused on fundraising and strengthening connections with alumni as the campus’s $200 million Advancing Excellence Campaign entered its final months. The campaign ended with a bang, nearly $12 million over the goal, on June 30, 2010. As Carney prepares to retire, he’ll need to muster plenty of physical strength and stamina to keep up with his grandchildren, who share his passion for sports. 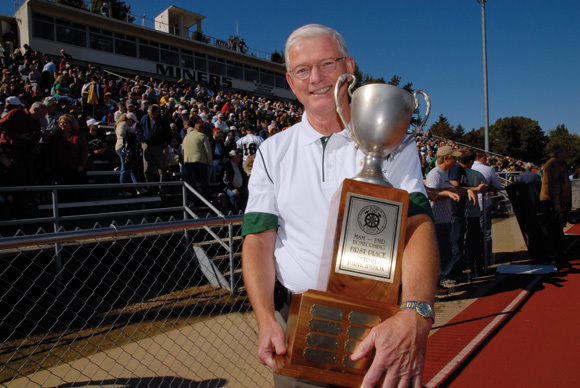 There’s no doubt that at Missouri S&T, Carney is going out a winner. Hello, everyone, my name id David and I am an alum of S&T and remember Mr Carney very well. It is a terrible thing about his wife as I know that they were very close. His involvement at this great school I am sure helped him a great deal in this time of sorrow. Yes I also remember the St. Patrick’s Day celebrations there as well with fondness.